A few weeks ago, Kathleen and I went to a talk at the downtown library about the St Francis Dam disaster. Back in 1978, I rode in a bike race that went up Francisquito Canyon, and I remember seeing the ruins of the dam during the race. At the time, I didn’t know the history of it, but I could see that they were ruins of something big in the canyon. To this day, it appears that there is still some disagreement about the fundamental cause of the dam collapse. 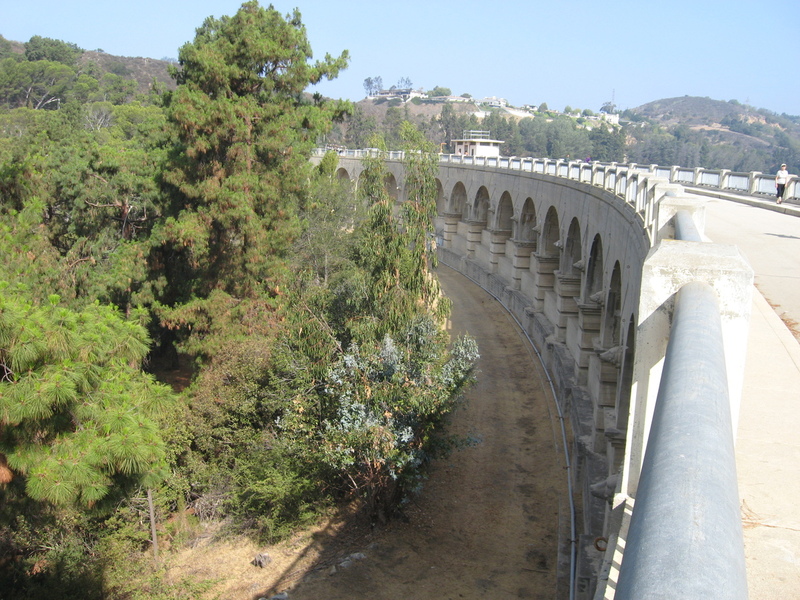 But one thing that they talked about that I’d never heard before was that the St Francis Dam was one of two dams that William Mulholland and the DWP built to store water from the Los Angeles Aqueduct. 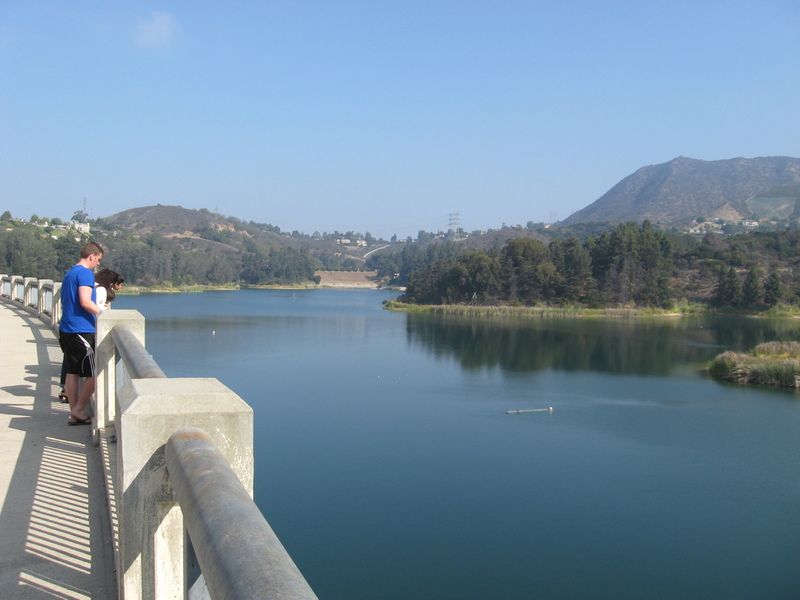 The St Francis Dam collapsed not long after being filled to capacity, while the other dam still exists, holding back the Hollywood Reservoir. 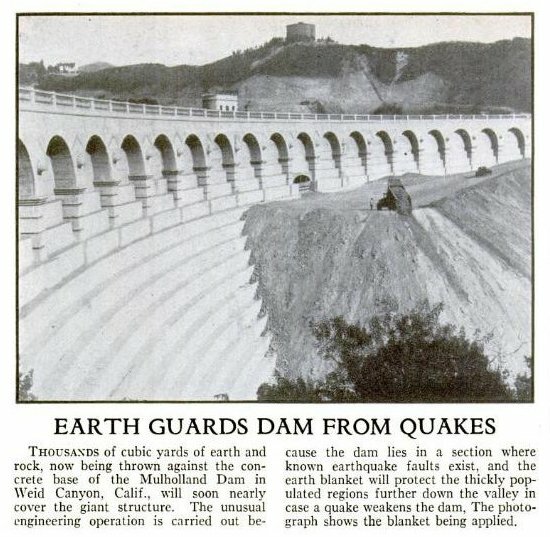 Apparently, soon after the St Francis disaster, people looked up at the dam above Hollywood and realized that it was essentially the same dam as the one that had failed catastrophically in Santa Clarita. So the DWP embarked on a program to basically fill in the canyon in front of the dam with dirt, and then to plant trees on the slope. Ostensibly, this was to reinforce the dam, but it also had the effect of making the dam much less obvious. From below, it just looks like a little bit of concrete wall on top of the hillside. Of course, I decided that we needed to go see this close-up. I’d heard recently that the path around the reservoir is open now for hiking and bicycling, so I dusted off the “Chris Brown’s House” route and, with a few modifications, we were ready to go. 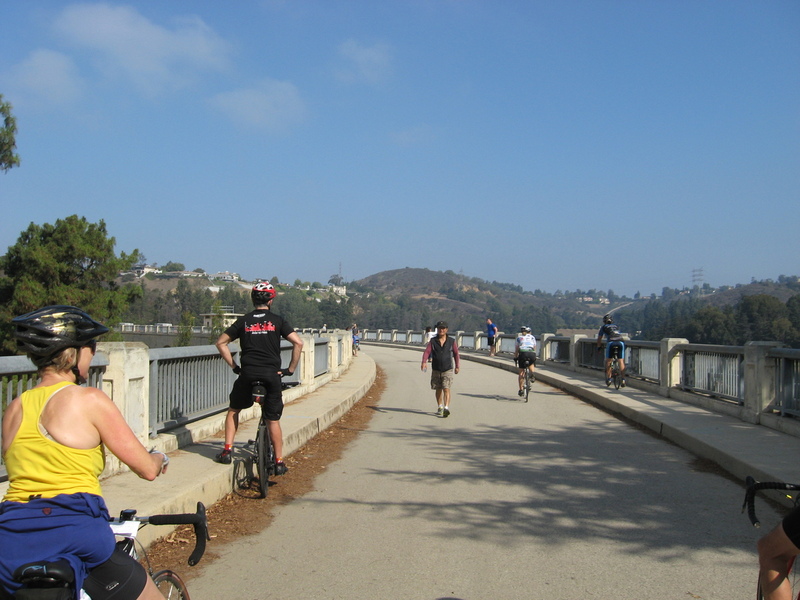 I told everyone that I thought that this might be a slightly easier ride than the others we do that go by Lake Hollywood, since we would not be riding up the hill all the way to the Hollywood sign. But it still turned out to be pretty hard. The climb up the canyon to the dam was quite steep. But when we came around the last bend, I could see the dam. Sort of. It just looked like a hillside. 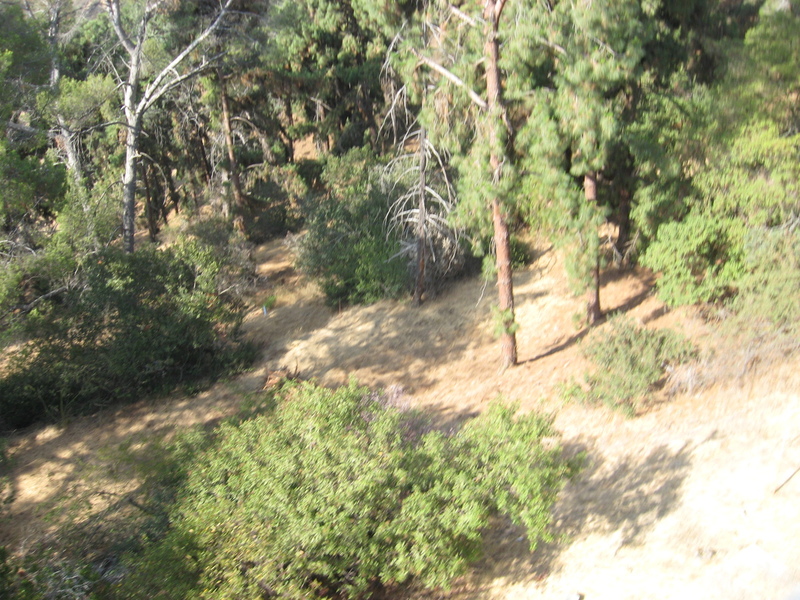 The trees that the DWP planted are all quite large now, and it’s not obvious at all that there’s a dam there. 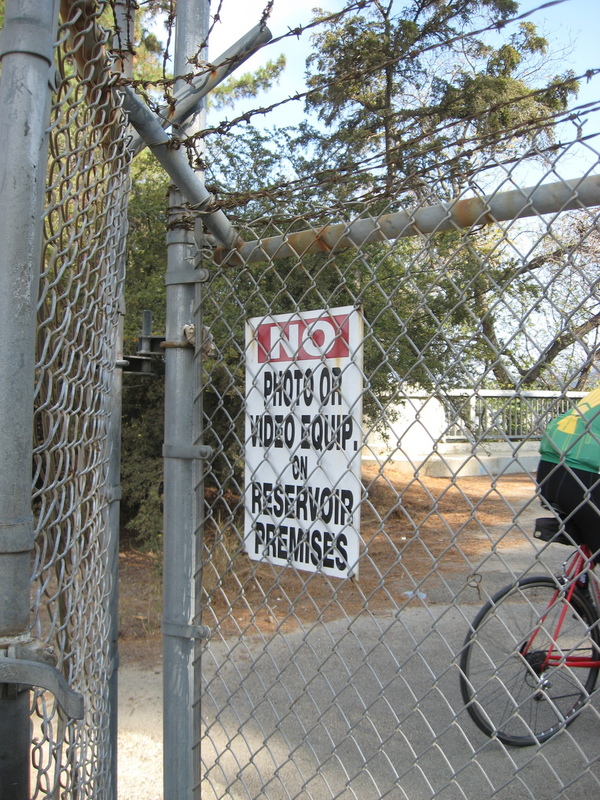 At the gate to enter the path around the reservoir there was a sign saying that photo and video equipment is not allowed. In the modern age, I don’t see how they could possibly expect that anyone would follow a rule like that. 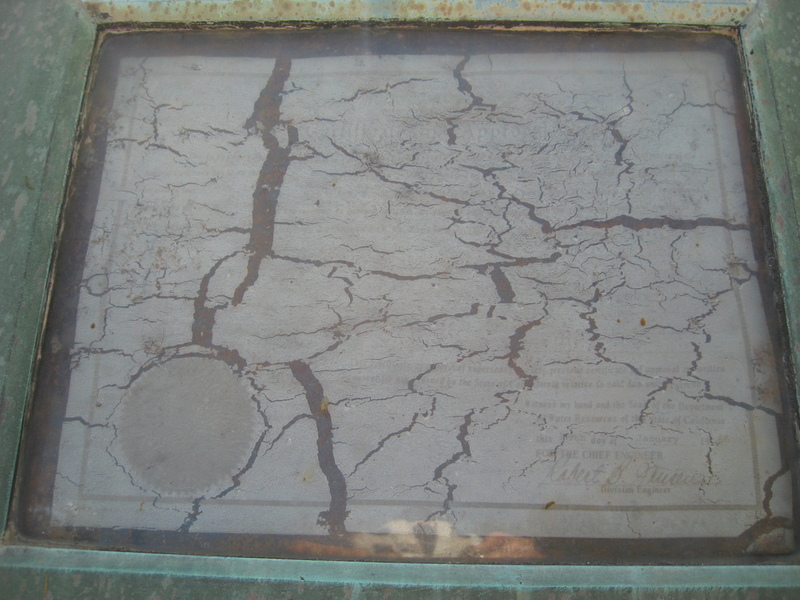 On the far side of the dam, I found a little display case with a faded certificate in it. It was dated 1966 and signed by the chief engineer for the DWP. 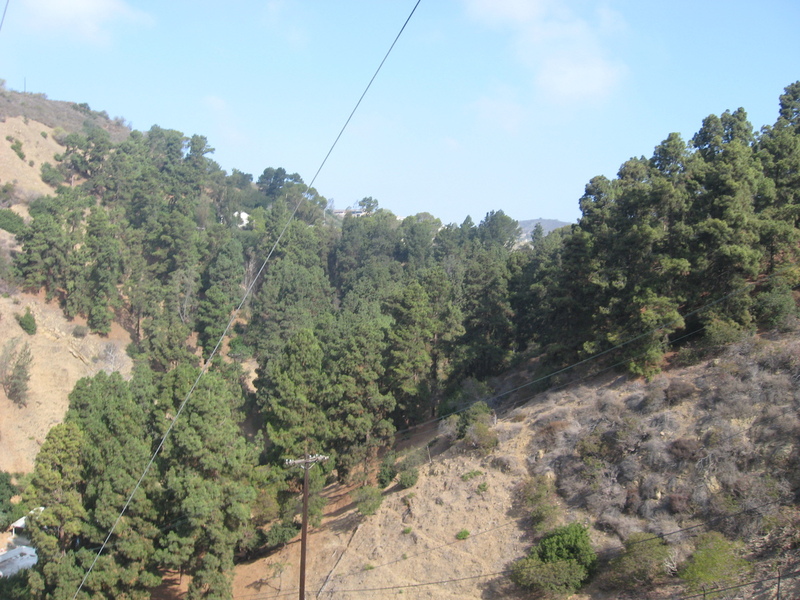 Continuing on around the lake, we got back to the main road and groaned up the Lake Hollywood hill. Then down the other side into Burbank for snacks at Priscilla’s. 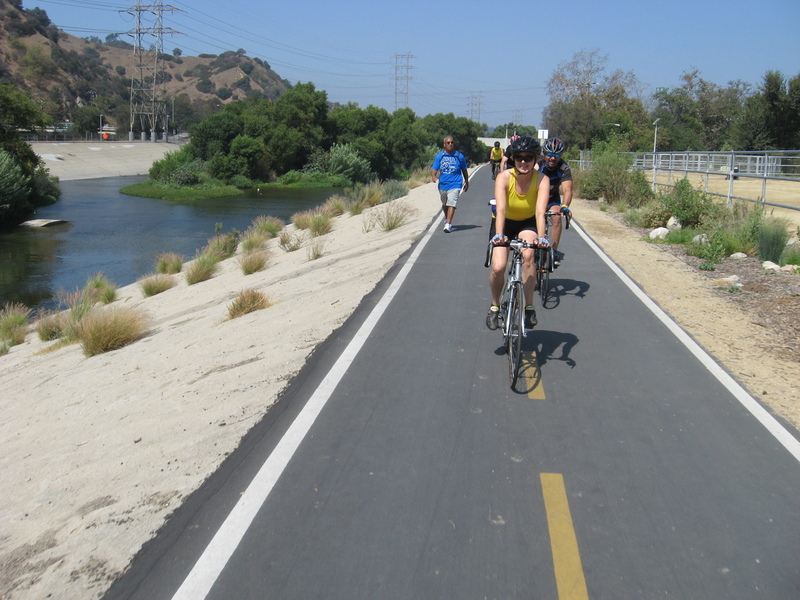 On the way back, Martha showed us how to get to the Glendale Narrows Riverwalk. 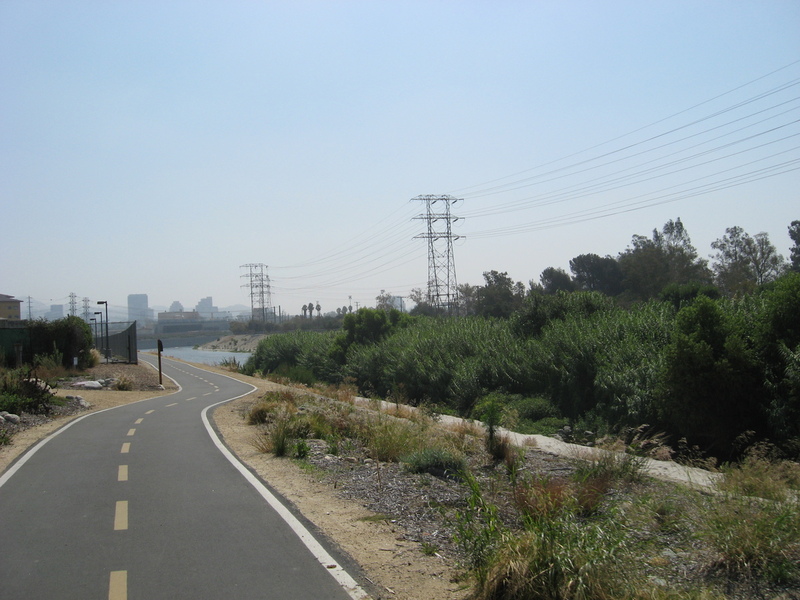 This is a short walking and bike path they built along a stretch of the L.A. River. It was a nice little shortcut. All told, it was a nice day for riding, and an interesting bit of history, too.